Month One is over now. That’s weird. Here’s my first 26 Things update. 3. Create a family tree. 4. Cook through a cook book. I have been cooking! I’m not exactly cooking through my cook book, but I’m making progress. More on that later. 5. Visit 13 new restaurants in Boston. 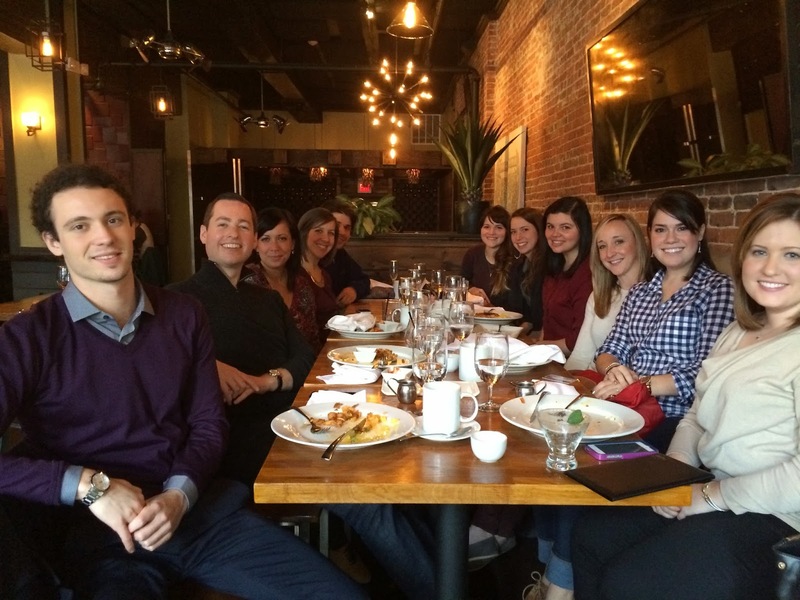 On my birthday, a bunch of us went to brunch at BOMA. Morgan had made a reservation, and it was so nice to be able to walk in and not have to push our ways through the brunch crowds. This place didn’t start getting busy until we were getting ready to leave, so that was nice. The food was good, although everything seemed to have been cooked in duck fat. Not sure how I feel about that. Saturday night Heidi, Erin, and I had dinner at Mela. I had very good chicken tikka masala, chai, and garlic naan. It was a tad bit expensive, but the chicken was quite tender. It was tendoori. Do you get my joke? 6. Take a photography class. 7. Take an acting class. 9. Use a sewing machine. Summer and Sam are taking a sewing class at a craft store next month. I should just do that too. Because unless I buy this baby, I probably won’t come across a sewing machine to use. And even if I do, I wouldn’t know how to use it in the first place. 10. Do a Philippians bible study. I have the feeling that my laptop is going to die soon. It’s been about three years or so since I got it–Dell’s don’t last THAT long. So I finally started on this. I pulled out my external hard drives and started organizing everything into folders and subfolders. Now I just need to go through the many folders and sort through all the pictures. 14. Hang pictures in room. Not quite there yet, but I did finally hang up my cork board. Now I just need to stick things on it. I started this too since I had the hard drives out. I came across old AIM conversations that had saved on my computer. That was entertaining. Oh how I miss the days of AIM. I am now at 50%. I guess I kind of cheated by starting out at 30%, but oh well. The goal is to save, so save I shall. 20. Find a doctor in Boston. 21. Find a dentist in Boston. 22. Visit New York City. 23. See a broadway show in NYC. I knocked these both out at once. You can read about my New York trip here. 26. Go on a weekend trip alone. Not bad for my first month. I was only able to cross two things off this time around, but I’m working towards a lot of things, so I’m happy with my progress. Well done for month 1! BOMA's menu mentions the duck fat thing, which is how we knew. I love tacos and craft beer and I’m forever on a quest to become both a morning person and a runner (the beer obviously does not help with these endeavors). Welcome to my blog about the things.